What is more romantic than the light of a full moon glinting off of fresh raindrops resting on the lush foliage of the rainforest? Well, if you are the San Carlos tree frog (Dendropsophus phlebodes), soft moonlight is a complete turnoff. This gold frog, barely an inch long, with brown zigzagging lines, feels most amorous on cloudy nights after drenching rains. Males form large choruses in the foliage above temporary ponds of water in Central America during the rainy season to serenade females. Their sweet song, which sounds like a low pulsing “creek” (download the ringtone below! ), becomes more feverish as more males join. Males will synchronize their calls and add variations, known as click notes, to distinguish themselves from the crowd. The moon is a total atmosphere-killer for the frogs. Their calling and breeding activity peaks about three days after a heavy rain, however, the appearance of the moon dampens the frogs’ singing. When the conditions are right females will lay up to 400 eggs in a pool of water in small groups after mating with a male. The eggs will float on the surface of the water and attach to plants sticking out of the water. The tadpoles hatch between August and October, and they stay in the shallow areas of the ponds until they mature. Right now the IUCN considers the San Carlos tree frog to be of least concern, with a stable population. Localized threats, however, include deforestation for agricultural development, logging, human settlement and pollution. Photo by Brian Kubicki, Costa Rican Amphibian Research Center. 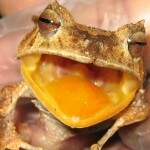 ALL-NEW frog ringtones: Download the San Carlos tree frog’s call! 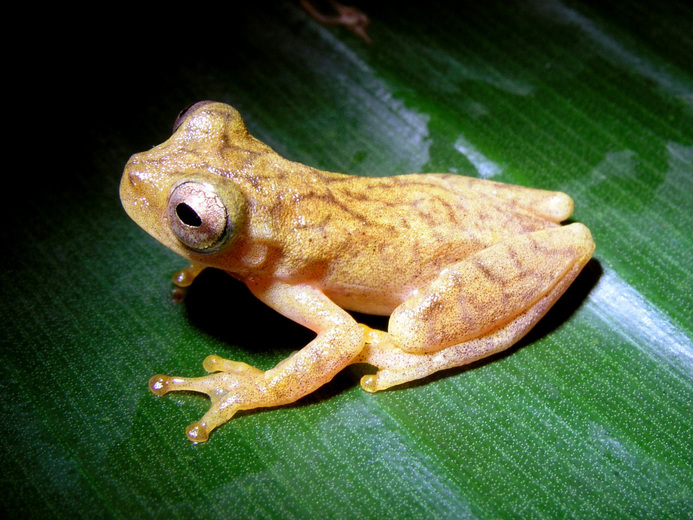 This entry was posted in biodiversity, Cute Frog of the Week, why frogs matter and tagged Cute Frog of the Week, Dendropsophus phlebodes, San Carlos tree frog by Lindsay. Bookmark the permalink.